For those who wish to prepare their own tax returns in the comfort of their home, Summit Tax Solutions offers low-cost, online, tax return preparation, services. These products are offered in partnership with ‘1040.com’ a service of Drake Software. This award-winning software allows even a novice to prepare and E-File complicated tax returns with confidence. The taxpayer has the option of using the online software in interview or forms mode. With this low-cost option, there is no software to purchase, install, or down-load. The online application software is resident on a secure server. Other competing products cost far more and may require bothersome software installation on your computer. Why consume valuable disc space, year after year, with a limited-life utility? 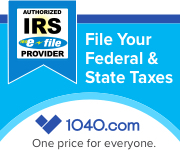 The cost to prepare and E-File a 1040 with various business income is $44.95 (State add $24.95), a 1040 with itemized deductions is $24.95 (State add $19.95), and a 1040EZ is FREE (no additional charge for State). No need to determine which form is right for you; 1040.com will do this automatically. If you have additional questions regarding this service please click here to peruse some frequently asked questions. Otherwise, click the image below to begin your tax preparation online NOW!